Family historians could be forgiven for thinking that resources – whether on-line or not – are the be-all-and-end-all of genealogy research. Certainly all the headline stories tend to focus on the latest brand new or upgraded digital releases or the newly accessible collections increasingly being made available through national, county and city archives. Now, I’m not going to deny that learning of a new resource doesn’t send a tingle of excitement down my spine. Of course it does. But resources, new or old, are not all that family history is about these days. There are now a great many alternative ways to get involved, to enjoy your research and to extend or share your knowledge of your ancestors’ lives. You might, for example, want to connect with a sociable genealogical community in your own neighbourhood, or you might choose to seek out and share information with like-minded folk on-line. Or maybe you’re a truly generous soul who wants to donate some spare time in transcription and similar projects to help other researchers, or perhaps you simply prefer a bespoke approach to extending your understanding of your family. Today, genealogy and the Internet seem natural partners. So much so that ‘going off-line’ can feel a little like ‘going off-piste’ – altogether too adventurous for the novice! But it’s worth remembering that family history research and a genealogy community existed long before www slipped so effortlessly into our everyday language. As the popularity of ancestral research has grown, so that community has become better organised. There are now three genealogical societies with an island-wide remit, plus a healthy number of more localised or regional groups; collectively they provide the life-blood of Irish family history research. Most are members of the Council of Irish Genealogical Organisations (CIGO), a lobby group that campaigns on behalf of all Irish genealogy researchers – no matter where they live – for better and greater access to source material. Joining a local or national group brings the opportunity to meet up with like-minded people, and to attend regular lectures or outings on research issues or specialised social or family history themes. 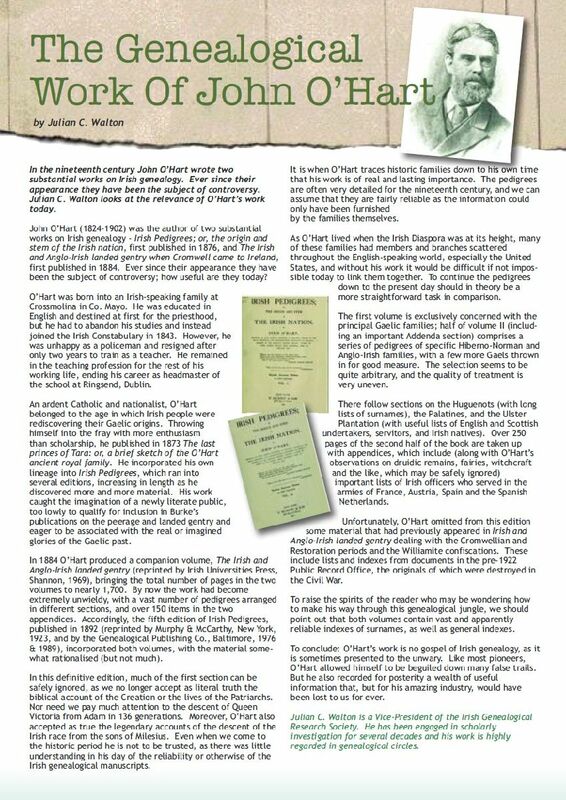 Most organisations also publish newsletters, journals and books crammed with valuable insights, and many work closely with their local and regional archives on transcription and indexing projects. Aside of genealogical groups, there are also many historical societies across the country. They have a different focus, but one that complements the genealogist’s curiosity about the area and community where their ancestors lived, loved, worked and died. Some even run their own heritage centre or town museum. Historical and family history societies give you the chance to put something back into the growing pot of accessible genealogy records or to simply keep local knowledge and memories flowing. Whether you’re best suited to transcribing old documents, helping to organise the lecture diary, or making tea and buns for members’ meetings, you’ll find such groups will always be happy to have another volunteer. Local, regional or national, they’ll snap up your skills and enthusiasm. If membership of such groups isn’t for you, an on-line community may suit you better. They come in many guises. Probably the most obvious are genealogy forums where you can respond to the questions of other researchers and get answers to your own queries. RootsChat.com and Boards.ie are the two that I happily recommend; they both have some very knowledgeable regulars. Blogs are another way of extending your grasp of history, genealogical techniques and myriad Irish heritage and culture issues. There are loads of them. Some are niche, some have a wider remit. Some are professionally produced, some are published by enthusiastic amateurs who may (or may not!) be true experts in their field. Most allow comments where you can pose questions or add your own views on the subjects under discussion. Of course, you could always start up your own blog to tell the world about the highs and lows of your personal ancestral hunt, to discuss the trials and tribulations of a family historian, or to offer advice via your own experiences. Twitter is another route to a worldwide genealogical community. While ‘what I had for breakfast’ tweeters do exist, they are easy to avoid if you take your time in deciding who to ‘follow’. Soon enough, you’ll be making friends (if you want to) with people whose interests you share, and swapping news and ideas for further investigation. Still on-line, you could connect with one of the free Internet-based archives for volunteer-donated records and materials. 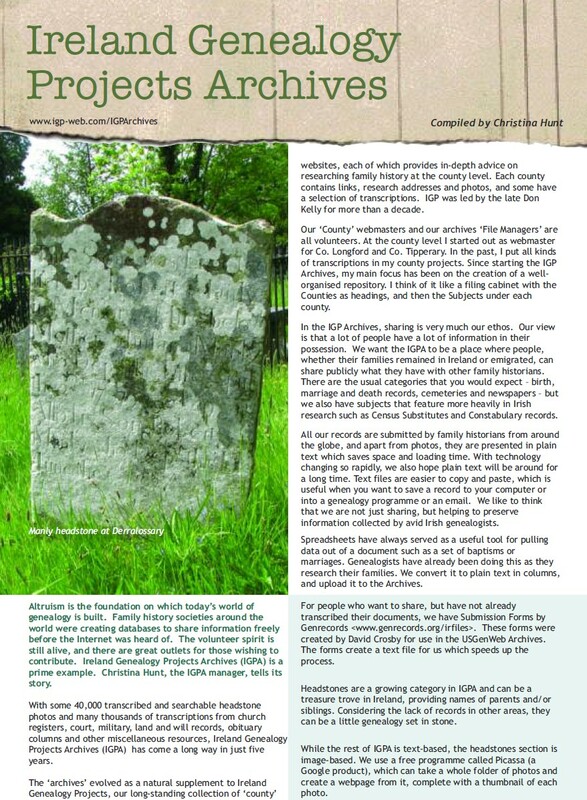 Ireland Genealogy Projects Archives is a great example of a website that uploads photos of gravestones, transcriptions of records, obituaries and newspaper reports that researchers have come across. Facebook, too, has several Irish genealogical groups that meet in cyberspace. There really is a big wide genealogical world beyond the record collections, and it’s worth venturing into it! People who have done no family history investigation don’t understand the pleasure you can get from a research trip. A genealogist is never too seasoned to get a kick out of new sources and experiences. Recently I visited the General Register Office of Northern Ireland for the first time since the early 1990s. The trip was prompted by being told by a Belfast-based colleague that GRONI’s upgraded facilities were now fully functional. Having booked myself in for an Index Search (£14), I arrived on the appointed day and was shown up to the search room. It was equipped with computers for twenty or more visitors. Within minutes I was finding results. The births database indicates the child’s exact date of birth and mother’s maiden surname. For deaths, the exact date of death and age (or, for more recent years, exact date of birth) are stated. Marriages are best of all. The spouse’s full name, the exact date of marriage and place of marriage are given. The name of the church is stated except in the case of Roman Catholic ceremonies, where the registrar’s district is given. GRONI’s facility covers records for all six counties of Northern Ireland from the commencement of civil registration (1845 for non-Catholic marriages; 1864 for all other records) forward. It should be remembered that pre-1922 records for Northern Ireland are available also through GRO Ireland in Roscommon / Dublin. To go beyond GRONI’s computerised indexes you can get a ‘verification’ for £4. This consists of being shown a digitised image of the record on a computer screen and being allowed copy down the details. The price of your first two verifications is included in the £14 search fee. A more elaborate option is the Assisted Search (£35 per hour), but certainly that would not be for the first time visitor. The only way of getting a print-out of the digital image of an actual record is to purchase a certificate. This costs £14, a pretty expensive option. There are pros and cons when comparing GRONI’s facilities with those offered by GRO Ireland. On balance GRONI is streets ahead of its older sibling south of the border. Furthermore, I am reliably informed by GRONI’s management that its earlier material will be searchable on-line within two years. If only those in power at GRO Ireland in Roscommon were so interested in engaging with the public. GRONI is not the only Belfast record repository that could teach the Republic’s institutions a thing or two about research facilities. In May of last year the National Library in Dublin downgraded its reading room services, making efficient research nigh impossible. Having been frustrated in my attempt to do extensive newspaper searches there, I found it worthwhile to stay over in Belfast to use the newspaper section of Belfast Central Library. This repository is more akin to Dublin City Library & Archive in Pearse Street, but both now offer better research facilities than the much larger national institution. The newspaper library of Belfast Central is around the corner from the main building, which is in Royal Avenue. It is the most user-friendly newspaper research area I have ever visited. As well as Belfast publications, which were the focus of my research, they hold a range of local titles from across Northern Ireland and Donegal, as well as the Irish Times and a good run of the Irish Independent and the Irish Press. There are hardcopy and microfilm options in most cases. You may order only one item at a time, but each hardcopy newspaper I ordered was on my desk in less than five minutes. There was no limit to the number of requests I could place. I went through several volumes of newspapers per hour, and each volume was delivered with a smile. The powers that be in Belfast Central Library evidently understand the nature of research. Belfast has two other record repositories of interest to genealogists, though they were not on my itinerary for the recent visit. The Linen Hall Library is within walking distance of both GRONI and Belfast Central. Situated in the heart of town, facing City Hall, the Linen Hall is my idea of what Heaven’s research facilities would look like. With its unique nineteenth century entrance, the high ceilings of its reading rooms, and its curvaceous staircases, the Linen Hall gives a feeling of connection with the past. The institution was founded in 1788 and it is the last remaining subscribing library in Ireland. Its Irish & Reference area, on Level 4, is where to find the likes of early periodicals and newspapers, manuscripts, publications in Irish, Ulster Scots and Ulster dialects, early Belfast books, and a very extensive collection of genealogical publications. Slightly away from the centre of town is the city’s most important place of research, the Public Record Office of Northern Ireland. 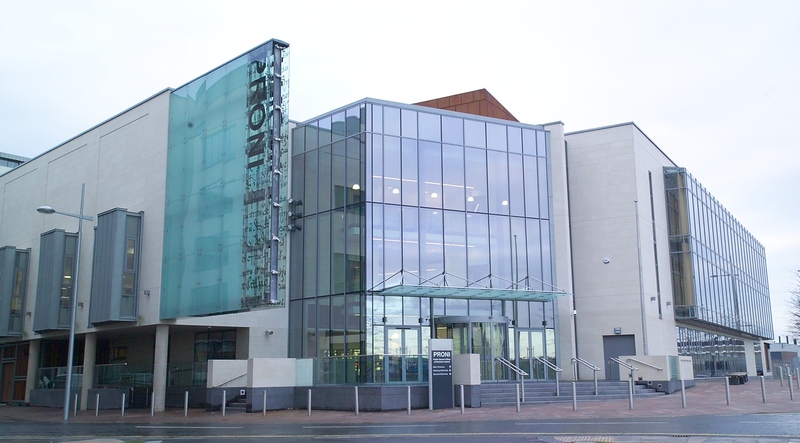 PRONI moved into its new headquarters in the Titanic Quarter just a year ago. The spacious purpose-built facility is an impressive state-of-the-art record repository. It is one of Ireland’s premier store-houses of local and family history material, principally but not exclusively for the province of Ulster. 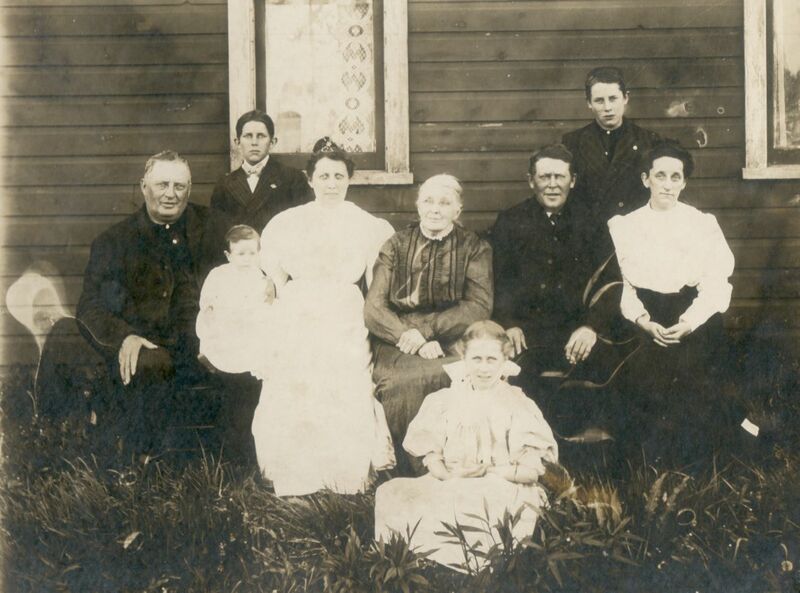 Sitting at home finding ancestors on your computer may be most family historians’ dream scenario. It’s convenient; it can be very rewarding, but it’s also solitary and somewhat sterile. A research trip to a library or archives that welcomes your presence and caters for your needs is an entirely different experience. This is one of the elements that encourage people to cross oceans to visit Ireland in pursuit of elusive ancestors. On 2 April 1912, RMS Titanic took just sixty-two seconds to travel down slipway number 2 into the water. She left the Harland and Wolff shipyard in Belfast that day for sea trails and her maiden voyage. RMS Titanic became one of the most famous ships in history when she hit an iceberg in the North Atlantic and sank with the loss of 1,522 lives twelve days later. 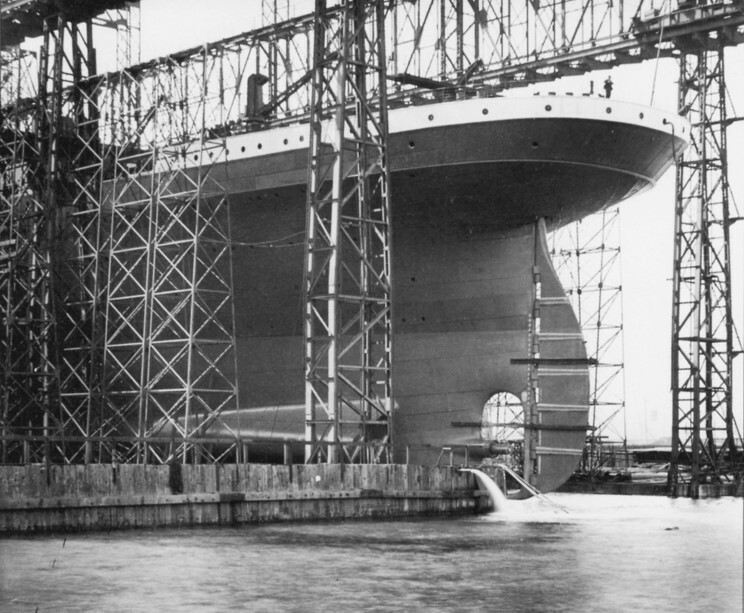 Since it was founded in 1862, the Harland and Wolff shipyard had produced some of the most famous ocean liners in the world including RMS Olympic, sister ship to Titanic, RMS Britannic and RMS Cedric. The ship most closely associated with the city of Belfast is, of course, RMS Titanic. From 31 March 2012, the Titanic Belfast centre provides a visitors’ experience which commemorates the tragic history of the ship and its passengers. The magnificent new building evokes the grandeur of the great ocean liners and it has become a Belfast landmark. This centre is the tribute to the three thousand Belfast men who built Titanic, the largest man-made structure in the world, the people who sailed on her and, most especially, those 1,500 people who lost their lives on the night of 14 April 2012. Visitors will learn the stories of many of the passengers who sailed on the maiden voyage of Titanic and get a glimpse of third and first class staterooms. 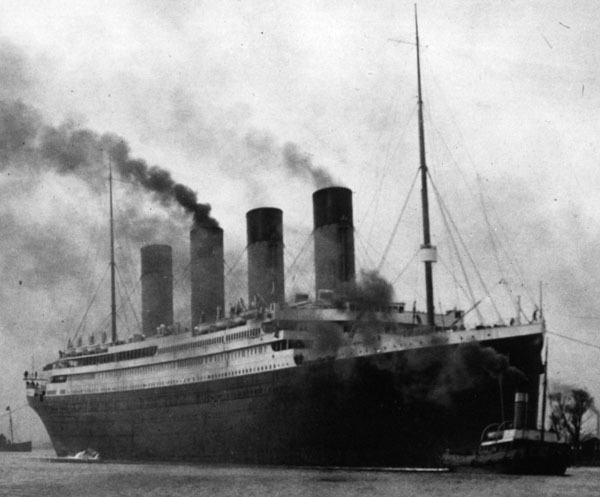 Since it was founded in 1862, the Harland and Wolff shipyard had produced some of the most famous ocean liners in the world including RMS Olympic, sister ship to Titanic, RMS Britannic and RMS Cedric. The exhibition provides a tour through nine interpretive and interactive galleries, bringing the visitor through the shipyard, the launch, the maiden voyage, the sinking and the 1985 discovery by oceanographer Robert Ballard of her final resting place. The atmosphere is created with sights, sounds and smells of the ship along with recordings of survivors’ memories. Belfast, Titanic’s ‘home town’, has a right to claim Titanic as its own and has done so in a striking and memorable way. Cobh, Co. Cork, or Queenstown as it was known when RMS Titanic arrived on 11 April 1912, also remembers the Titanic connection. At Queenstown, 113 passengers boarded the ship. Cobh has commemorated its history as a major port of emigration for Irish people seeking a better life in America by converting the White Star Line Office into the Titanic Experience Cobh centre. While on a smaller scale than Belfast, the Cobh exhibition brings visitors through the boarding process which would have been the experience of hundreds of thousands of emigrants bound for America. Audio-visual exhibits evoke memories of the Titanic and the passengers who boarded in Queenstown. The pier from which tender ships, Ireland and America, transported passengers to the great liners bound for America can also be seen during a visit to Cobh. For emigrants travelling to America, their last sight of land was Ireland and for this reason especially, the memory of passengers aboard Titanic is cherished in Cobh. A third location in Ireland has a very close association with the Titanic. Of the 113 Irish passengers who boarded at Queenstown, fourteen were from Addergoole parish (Laherdane), Co. Mayo. Of these, eleven perished, comprising the largest proportionate loss of life among passengers from any single locality represented on board. 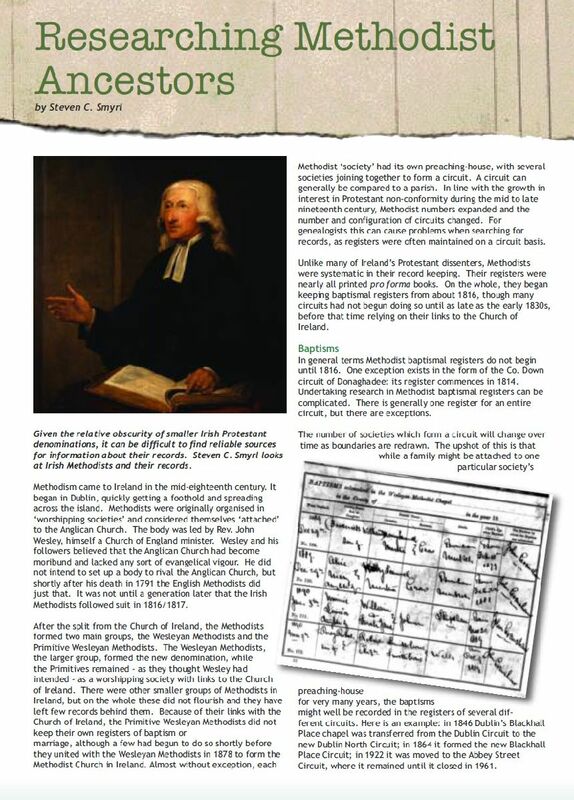 The impact can be appreciated when compared to the total parish population of 3,496 in the 1911 Census of the parish of Addergoole. The eleven lost Addergoole passengers represent 0.3% of that population, and 2% of all the third class passengers who perished aboard Titanic. Since 1937, in the early hours of the morning of 14 April, a bell in St. Patrick’s Church grounds, Laherdane, has been rung annually in memory of the fourteen Addergoole passengers. Starting at 2.20am, the time at which the ship sank beneath the waves of the North Atlantic, the bell tolls slowly for the eleven who were lost, followed by fast rings in gratitude for the three girls who were saved. Addergoole parish commemorated the centenary with the Mayo Titanic Culture Week 8-15 April 2012. The programme included a re-enactment of the leaving of the fourteen passengers, a traditional ‘American Wake’, the annual ringing of the memorial bell and other activities. Two unique memorial stained glass windows, one depicting boat 16 in which Annie Kate Kelly survived, were donated by American descendants of the Addergoole survivors. The Titanic Culture week in Laherdane, the smallest, but perhaps most poignant, tribute to the memory of those who sailed on the Titanic, offered the opportunity to connect on a personal level with the fourteen people who left Addergoole for a better life in America, of whom only three arrived. Ireland remembers Titanic in the city where she was built, the last port from which she departed, in every village from which a passenger left and in every family that lost a loved one that night. Eileen Ó Dúill is a Member of the Association of Professional Genealogists in Ireland, and she specialises in legal and probate research, post-1864. When you hit the proverbial ‘brick wall’ in family history research, DNA testing can come to the rescue in many cases and it can help to solve mysteries. It can also uncover new mysteries such as non-paternity events (NPE). It is important to understand the basics before embarking on genetic testing for family history so that you know what it can and cannot do [www.dna-testing-adviser.com]. There are three main types of testing used in family history research: mitochondrial DNA (mtDNA), autosomal DNA (atDNA) and y-chromosome DNA (yDNA). We all have mitochondrial DNA (mtDNA) which is passed down by a mother to all her children. However, males do not pass on their mtDNA to their children, so the value of mtDNA testing is in tracing back along a maternal line (your mother, her mother and so on). Unfortunately, mtDNA doesn’t generally follow a surname as women traditionally changed their surname on marriage. Autosomal DNA (atDNA) can be inherited from any line. Therefore, it can find matches in any branch of your family tree but it works better when two people share a recent ancestor. Only men have y-chromosome DNA (yDNA) which is passed down from father to son. yDNA mutates very infrequently, and therefore it can be used to trace a biological paternal line. The most significant benefit of using yDNA in genealogical research is that the surname is generally co-inherited with the yDNA. As yDNA is currently the most useful and universally used DNA tool in family history research I will focus on this. 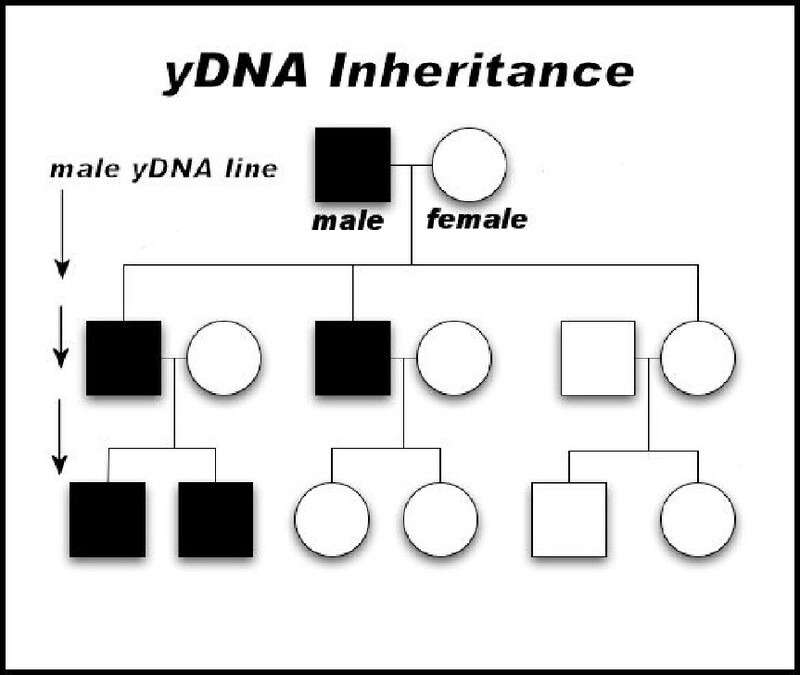 The diagram shows how yDNA is passed down from father to son. There are many reasons for considering yDNA testing. 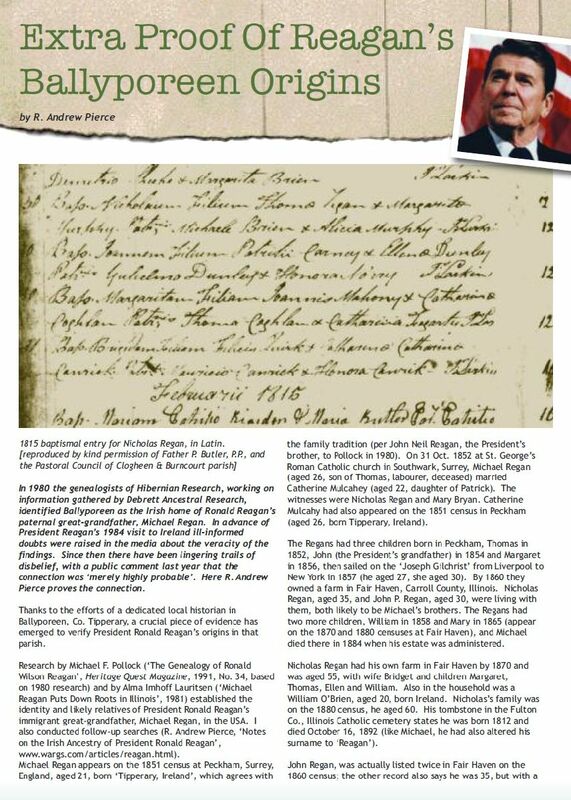 You may be in the New World and trying to trace your paternal ancestry back to your Irish origins or living in Ireland and looking for descendants of relatives who left Ireland in Famine times. You may be trying to establish a connection with a particular family line or you may be researching your surname in general. DNA testing can be as simple as a mouth swab, done at home and the sample mailed back to the testing company. The first thing is to decide what you hope to achieve and which family surname you want to research. Then you need to select a male with that paternally inherited surname and choose a testing company. Family Tree DNA [www.familytreedna.com] which is based in Texas, USA is the testing company with which I am most familiar. Each surname study at Family Tree DNA is managed by voluntary administrators who help participants with understanding their results. For example, the O’Shea yDNA Project [www.familytreedna.com/group-join.aspx?Group=OShea], which I have been involved with since it started in 2003, was set up to study the O’Shea Surname using yDNA. Participants generally start with a 37 marker test and upgrade to 67 markers if required. If no suitable Irish surname yDNA project is available for your particular surname at Family Tree DNA, the Ireland yDNA Project [www.familytreedna.com/project-join-request.aspx?group=IrelandHeritage&projecttype=G] acts as an umbrella project for all men with Irish ancestry on their paternal line. When the decisions have been made and the kit ordered, the mouth swab is done a few hours after eating and the sample returned to the testing company. Then all you have to do is wait patiently. After a few weeks, the yDNA results will be sent to you by email. The results comprise a set of numbers (y-haplotype) relating to the number of short tandem repeats (STRs) on each marker tested, on the y-chromosome. Then the excitement of seeing with whom you match begins. The testing company lists the names of your close matches along with their email addresses. The statistics involved in analysis of yDNA results can provide two people with an estimate to how far back their common ancestor might be. However, yDNA testing cannot tell you what is the exact relationship between two people. Making contact with people you match across the globe can be exciting. You can compare notes to try to find your common ancestor. People who match each other often share photos and may meet up. This forges links between the Irish Diaspora and those still living in their native homeland. People talk euphemistically about a ‘non-paternity event’ (NPE) when yDNA results are not as expected. On the other hand, some people have questions regarding adoption in their family and yDNA testing can help them find their biological surname. For the enthusiast, testing SNPs (Single Nucleotide Polymorphisms) can provide further information on the migration of your ancestors, over thousands of years. The National Genographic Project [https://genographic.nationalgeographic.com], started by Spenser Wells in 2005, studies this migration of people from Africa about 60,000 years ago to all areas of the globe. In conclusion, DNA testing can be exciting and surprising. Finding genetic cousins can open up new lines of communications across continents. Adding the genetic genealogy tool to your family history research armoury adds an exciting dimension and can produce some interesting twists.